This Robert Graham Branded Shopping Bag establishes identity in multiple ways. A traditional Robes Graham logo is billboarded on the sides, with Tailor cloth measuring tape handles, Knowledge, Wisdom and Truth motto, RobertGraham.us URL, and signature decorative end panels. Any one of these might be considered branding enough. But is you are going to design a custom shopping bag, why not go all the way? 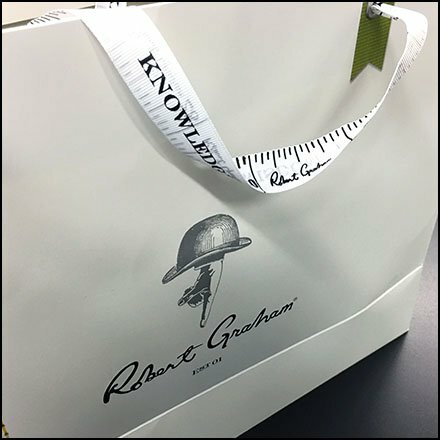 This Robert Graham Branded Shopping Bag from the designer’s Short Hills Mall, Chatham NJ store.